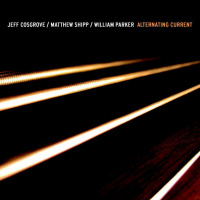 New to me drummer, Jeff Cosgrove, is matched up with Matthew Shipp on piano and William Parker on bass. From the beginning of the first track there is a subdued, almost trance like state set. The telepathic interaction between William and Matthew, who have countless dates under their belts together is evident from the beginning. William’s bowing of his bass weaves in and out seamlessly of Matthew’s dissonant jabs at the ivory. The opening track, “Bridges of Tomorrow” is a text book example of how a piano trio can improvise. You can hear Jeff, Matthew, and William take turns leading the music, falling back to their musical brethren, on the re-engage when necessary. In a setting where it can be easy to “over play”, this trio lets the music release while they play instead of forcing the notes. During the first half of “Bridges of Tomorrow”, Jeff plays the supporting role well, but the magic happens when he finally opens up his entire drum kit and take control during the second half. While emotionally, the music does not hit one extreme or the other, it definitely takes you on a wonderful ride. “Alternating Current (for Andrew Cyrille)”, the second track again starts with Parker bowing his bass. Jeff starts with brushing while Matthew comes in making long melodic runs which instantly took me to his solo album “Songs”. A beautiful tribute track to a free jazz legend, building to a light frenzy before falling only to rise and fall again, you are quickly mesmerized. The finally track, “Victoria” a Paul Motian number, is played with the finest of delicacy. A somber number, which feels even more so in the piano trio format. The Motian influence on Jeff Cosgrove is most noticeable on this number through his use of ride cymbal and tender approach. All in all, a solid date, as one would expect with Matthew and William, and though Jeff Cosgrove doesn’t add anything new or spectacular, you still have to marvel at his ability to hold his own and lead a worthy set.